Are you looking for space rental in Nevada City or Grass Valley area for your upcoming wedding, party, meeting or event? 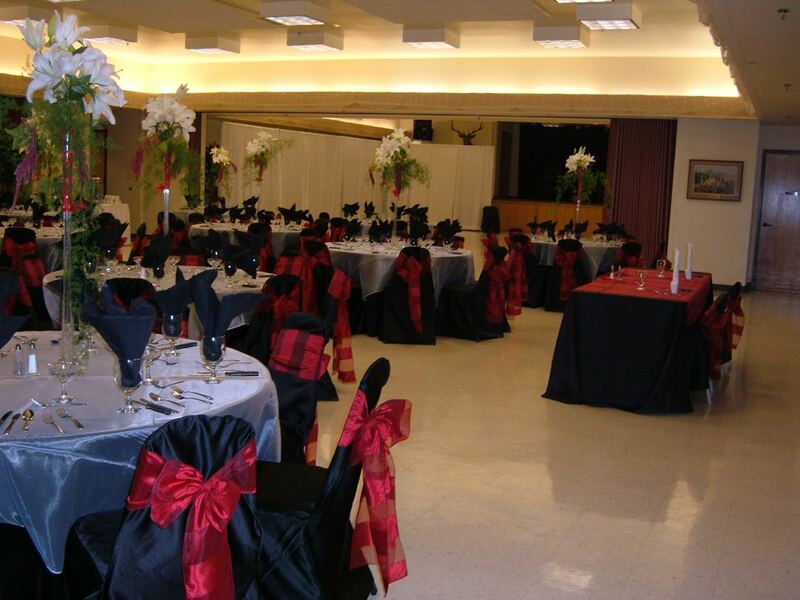 The Nevada City Elks Lodge in Nevada City has the accomodations for large informal or formal occasions. The range capacity is approximately 50 to 300 for sit-down events and 400 for non-food events with easy parking on-site. To find available dates and facility rental prices, contact us by e-mail (elks518events@gmail.com ), by filling out the Reservation Request Form or by telephone phone at (530) 265-4920. After you have successfully selected an available date for your event with the Elk’s Lodge, you may send your “reserve-the-date” payment of $200 by mail to: P.O. Box 611, Nevada City, CA 95959. Your guests never see the long hours you spend as you prepare for, and clean up after, your events. Neither should you! Let us take care of the behind the scenes work. You’re left with greeting your guests with your carefree and charming smile. We can help you with these events, and more! Just ask us. Floor plan shown below can be divided and sectioned off to accommodate smaller events or the entire area is available for larger events. Rent the area you need. The facility is handicap accessible. Banquet Room: There is one large room for functions and events or this same area can be partitioned to assemble several rooms. There is also an indoor altar constructed for weddings and a stage for bands and plays, plus a disco ball for dancing. Outdoor Weddings: We provide an outdoor altar in a rock garden surrounded by pine trees. Meetings and corporate events: There is a podium and stage area for guest speakers, audio system, and large screen for slide projector presentations. Rooms can be partitioned off to hold separate meetings. Capacity is approximately 50 to 300 and 400 for non-food events. Fully Staffed Bar: Good selection of call liquor, domestic and foreign beers, and wines. Portable bar service is also available. Full Dinners: We offer several meals with optional appetizers and desserts. Visit our Dining Menu page. Buffet: Breakfast, brunch, dinners or hors d’oeuvres. Full support staff to attend to the needs of our guests. Parking: Outside parking provided for 200 hundred vehicles. Cocktail Lounge: Contains four TV’s with one being a big screen to view sports or other special programming. The lounge provides a cozy atmosphere with propane burning fireplace and a piano.